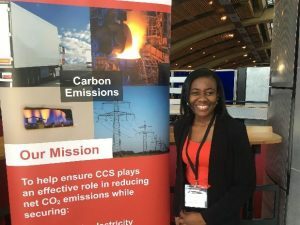 Grantham Scholar Gloria Mensah is researching how Carbon Capture & Storage technology interacts with politics. Here she reports back on an important conference that gathered international experts from varied fields to work out how to deliver a new agenda for this technology. Gloria found that advancement in research and technology alone is not enough for a technology to emerge: scientists and policy makers must work together to create real change. Gloria – the happy delegate! Carbon Capture & Storage is a climate change mitigation strategy. It is a technology that involves the capture of carbon dioxide gas from power plants or industrial plants and its transport through pipes down into geological reservoirs where it does not affect the atmosphere. 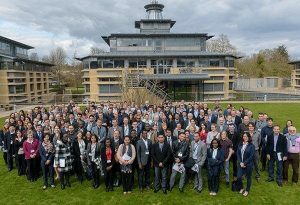 In March 2018, experts working in this field met at Cambridge University to participate in the UK Carbon Capture and Storage Research Centre’s (UKCCSRC) Spring Network Conference, under the theme ‘Delivering the New CCS Agenda’. As I work in a research field focused on understanding the politics of Carbon Capture and Storage (CCS) technologies, I reckoned this was a good opportunity to meet academics, industry stakeholders as well as government officials working in this area to learn and discuss my research. Arriving in Cambridge in the early morning, I was met by very beautiful weather – the sun was shining brightly. Being my first time in Cambridge, I took time to soak it in. 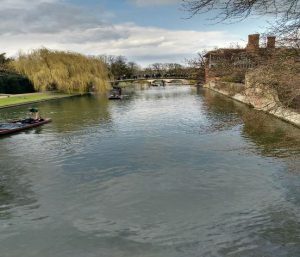 I would describe the scenery in Cambridge with just one word – beautiful! I also noticed that green transportation is a common means of transport – everyone seems to be on a bike. Delegates at the conference came from a wide array of fields: academic researchers from leading UK universities and research institutes; government officials from departments and agencies such as Business, Energy and Industrial Strategy (BEIS); Committee on Climate Change (CCC); UKCCSRC members; Carbon Capture and Storage Association (CCSA); CCS campaign groups and CCS industry stakeholders, amongst many others. I looked forward to interesting discussions with a good range of perspectives on the CCS subject. The first talk at the conference began with a view from Brussels. This talk provided insights into EU policy making processes on CCS, detailing how CCS had been prominent on the political agenda in recent years but now seemed to be missing from EU policy agenda. The speaker, Chris Davies, facilitator at the CCS Campaign Group highlighted that more campaigning is vital to get CCS back on the political agenda. Other talks covered CCS deployment and project updates from the UK. Such projects included CCS in Teeside, Caledonia Clean Energy Project and the OGCI’s Clean Gas Project. What I gathered from these talks was that though there seems to be a strong motivation to develop CCS in the UK, progress is rather slow with most projects still remaining in the development phases, requiring substantial government support if they are to be deployed at large-scale. Notwithstanding, there is still some good news on CCS for the UK from government’s perspective. The UK government’s Clean Growth Strategy Report released in October 2017 sets out government’s strategy for achieving its 5th carbon budget (reducing carbon dioxide gas emissions by 57% from 1990 levels by 2032) and also includes a new agenda for CCS. The UK government made a commitment to deploy CCS at scale in the UK by the 2030’s. Will Lochhead, the Head of Carbon Capture Utilization & Storage Unit (CCUS) at BEIS provided some insights into government’s new approach to CCS technology. He pointed out that government was committed to publishing a deployment pathway for Carbon Capture Utilization and Storage technology by the end of 2018, to define the steps for achieving the 2030 target. He also added that government was committed to reviewing the delivery and investment models for CCUS as well as organising a global conference on CCUS to foster the UK’s international collaboration with other countries progressing on CCS by the end of 2018. The conference also presented an opportunity to join panel sessions on either ‘Capture’, ‘Storage’, ‘Systems’ or ‘International’ aspects of CCS. Being an attendee at the ‘International’ panel session, this was a great chance to hear about progress on CCS activities in countries like Japan, Netherlands and the US. An interesting overview was given of the Tomakomai CCS Demonstration project in Japan, a large-scale CCS project under implementation. This project is being undertaken by Japan’s Ministry of Economy, Trade and Industry to showcase the viability of CCS from capture to storage. The project plans to capture 100,000 tonnes per year or more of CO2 which will be injected and stored in offshore reservoirs. CO2 injection has been ongoing since April 2016. The speaker noted that since the facility is located a few centimetres from the city, extensive public engagement was involved. 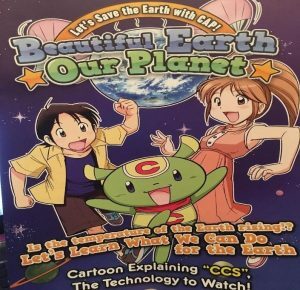 What I found illuminating was that public outreach activities included providing comic flyers for kids which explained CCS in cartoons, organising educational and site tours at the facility for children in primary and secondary schools and providing a forum for Tomakomai citizens to gain understanding on CCS technology. As a researcher listening to the ongoing deliberations, the issues that surround the implementation of technologies such as CCS became very clear. Advancement in research and technology alone is not enough for a technology to emerge. It has become crucial that scientists, academics and industry stakeholders gain an understanding of the policy making process so that they can effectively engage. On the other hand, policy makers need to be abreast with updates from science and research to inform their decisions. Public outreach represents a core strategy underpinning most successful strategies and it is important that the most suitable approaches are adopted. Perhaps, we can take a cue from the people of Tomakomai!